in Tuolumne & Calaveras Counties. Some History in the Gold Fields. The fire in Sonora November 14, 1849 saw the Stevenson's Rgt. being used as guards. It had started in a gambling tent where Shaw's Flat Road crosses Wood's Creek. It caused nearly $40,000 in loss. There were 5000 living in Sonora at the time. "It was on the occasion of this fire that Charles Bassett organized a guard of four ex-soldiers of the Stevenson's regiment, who were camping in the gulch then called by his name, but which is now Sonora Creek. 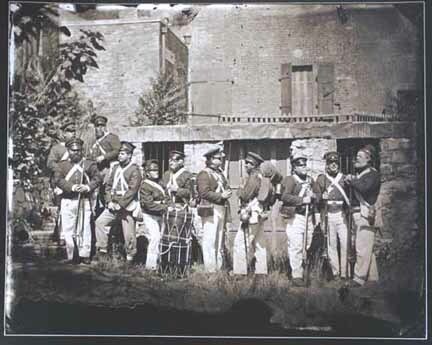 These men being in uniform and armed with their muskets, were stationed on the outskirts of the fire, taking charge of whatever property was saved, and not suffering anything to be removed from their supervision. By this means the thefts were prevented." - from A History of Tuolumne County 1882. "Immediately following the extinguishing of the fire (June 18, 1852), a new source of trouble arose. This was the attempt of certain parties to "jump" the land on which the houses had stood; but the attempt was frustrated by the interposition of an armed guard, which was organized to meet such proceedings " - from A History of Tuolumne County 1882. Records show that many of the members of the Stevenson's Regiment were there in uniform to add a sense of order to the chaos. $1,000,000 in damage. Fordyce J. Benjamin Co. H - Went to Helvecia where he was elected Alcalde in 1848; in `74 was a resident of Sonora and died in Susanville, Aug. 28, 1896. Lt. Edw. Gould Buffum Co. B - Was engaged in mining in `48 and `49, a reporter for the Alta California, very active in civic affairs recording most public meetings. In 1850 went east and published Six Weeks in the Gold Mines, returned to California `53 and rejoined the Alta. A member of the 6th session of the California Legislature from San Francisco; went to Paris, France in 1857 and committed suicide ten years later. Francis D. Clarke Co. D - Was mining in 1849, and also operating a ferry on the Stanislaus River in partnership with James Sirey (said to have been a member of the Regiment) from late `49 to 1855; was also a merchant and justice of the peace. He returned to the east and wrote A Pioneer of `47 and The First Regiment of New York Volunteers. He died at Orange, New Jersey in 1899. George N. Cornwell Co. H - Went to the gold mines after his discharge and later moved to Napa where he seems to have fulfilled his part of the regiment's purpose becoming a trader, farmer and owner of large quicksilver mines. He was a member of the 5th and 21st sessions of the legislature, postmaster, deputy sheriff and apparently all round politician. He died at Napa in 1896. Lt. William E, Cutrell Co. E - Settled in Jamestown in 1850 (AKA Peck Cutrelle*) Moved to Hawaii in 1854 and back to USA in 1865 Died in San Francisco May 28, 1868. James Drennen Co. A - Resided in Tuolumne for several years; died there in August, 1871. Dewit J. Harmon Co. I - Was living at Murphy's Diggings in middle 1870's. died at Kernville in 1888. Edwin Irving Co. A - Was mining at Mokelumne Hill for a short time after his discharge and in 1850 left for Nicaragua, returning to California in 1852..
Joseph B. Logan Co. I - Born in Phildelphia 1826 - Died in Springfield 7 Oct. 1857 Sgt. in Company I of the 1st New York Legion who came to California in 1847. Settled in Springfield, Tuolumne County where he died. Theodore Lopez Co. F - Apparently followed mining along the Mother Lode (near Melones April or May 1849*), living in Sonora in 1872, Tuolumne in 1882 and died at Sonora in 1887. William Luker Co. I - Was living at Sonora in 1882 and died at Sonoma in 1891. James O'Sullivan Co. A - A printer by trade and editor of the Sonora Herald, May 22, 1852; a member of the second Constitutional Convention from San Francisco; went to Sacramento where he died March 2, 1889. Artemus W. Richardson Co. G-C - Was county surveyor of Tuolumne County, died at Sonora, July 12, 1854. Abijah D. Talmage Co. A - Was killed by Indians near Mokelumne Hill in December, 1848. Lt. Hirum W. Theall Co. D - Was one of the earliest residents of Sonora (July 1849); died in White Pine, Nevada about 1869. * from Critical Notes by DeFerrari, in the Annal's of Tuolumne County.